Equilateral develops wireless network engineering software used by commercial, academic and military sectors. Sample applications include optimization of large-scale cellular systems, design of air-to-ground networks, and RF propagation prediction and spectrum management in a variety of environments. Equilateral also provides consulting services in customized software development, scientific visualization, geographical information systems, and mathematical analysis with an emphasis on network optimization. Equilateral’s goal is to help customers’ design and run networks that are cost effective, while still maintaining the highest possible level of quality. Equilateral’s products and services are used with great success by many different types of wireless operators in the US and abroad. Equilateral develops wireless network engineering software used by commercial, academic and military sectors. Sample applications include design and optimization of large-scale cellular systems and nationwide air-to-ground networks. In addition, Equilateral's spectrum management tools are being integrated into software platforms for the United States Army's WIN-T project. Equilateral Technologies develops and markets software tools for designing and optimizing wireless networks. 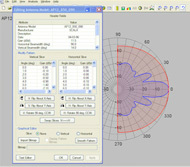 AerialView is a fast, highly interactive software application designed for engineers, students, and others interested in the analysis and visualization of antenna radiation patterns. Our Spectrum Management Engine (SME) provides automated frequency deconfliction and assignment.